Built largely between the 13th and 14th centuries it relied entirely on stone brought to the town by trading ships from such diverse locations as Caen in Normandy and Bembridge on the Isle of Wight. Maps and plans documented in the town Terrier shortly after completion, show that the town's perimeter fortifications measured almost 2 kilometres (1¼ miles) in circumference, was on average 2 metres (6’ 6”) thick, 6 metres (20 ft) high, and had 29 towers and 7 Gates into the medieval town – an incredible feat of engineering and perseverance by any measure. This walk takes in approximately half of the standing walls, towers and gates, but this half is by far the most visually stunning and historically interesting part of the medieval town. 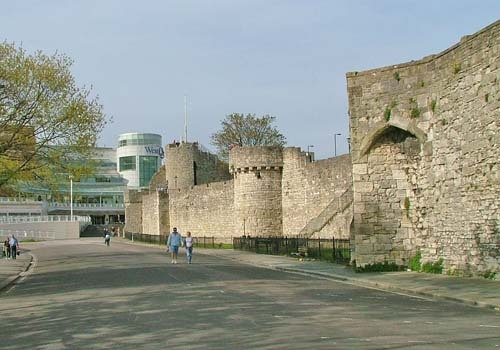 As well as several other exciting aspects of this walk, visitors will have the opportunity of traversing the top of long sections of the walls; visualise the site of Southampton’s early Norman castle; climb the highest remaining tower; enter two or three impressive and unique vaults; gaze upon the Tudor House to which King Henry VIII was thought to have been an occasional visitor; and walk through one of the most historically significant gateways in the whole of England. Our guide will acquaint walkers with several post Norman locations of special historical interest en route; from the site of Jane Austen’s house and garden when she lived in the old town, to American servicemen's convoy routes and monuments that line the path that more than two million of them took on their way to help liberate mainland Europe towards the end of the Second World War. For booking, or more information about this walk, please use the Contact Form on the Themed Walks / Tours Page.